Sheet divided roughly into upper and lower parts. 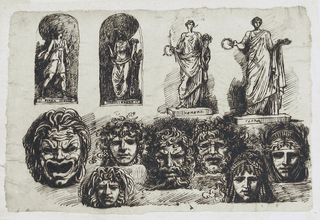 Upper part includes studies of four full-length sculptured figures, each labelled by name, proceding from left to right: Diana; 2 views of Ceres; Flora. Seven grotesque masks are arrayed horizontally across bottom part of sheet.